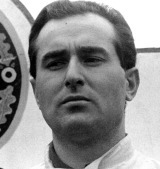 Lorenzo's racing career started in saloon cars loaned to him by the owner of the garage at which he was a mechanic. By 1959 he was on the grid for the new Formula Junior category, and his form over the next two seasons was enough to attract the attention of Ferrari. He was pipped for a vacant seat early in 1961 by compatriot Giancarlo Baghetti. Scuderia Centro Sud handed him his Formula One debut in a Cooper-Maserati and he drove well enough to secure a seat at Ferrari for 1962. Lorenzo was third at his first attempt, at Monaco. Despite only occasionally being selected by the team, he also won the non-championship Mediterranean Grand Prix. Dropped in 1963, he was soon back at Ferrari after Willy Mairesse was injured - he even won the Le Mans 24 Hours for the marque. Lorenzo's only grand prix victory came in 1964 when he triumphed in Austria at Zeltweg - he ended the season fourth overall, three places behind his team-mate, John Surtees. Monaco was to prove his happiest hunting ground in 1965 and 1966 - with second places - and it was in the second half of 1966 that he finally became Ferrari's No. 1 driver. Monaco was also to prove his undoing. Running second behind Denny Hulme's Brabham during the 1967 Monaco Grand Prix, Lorenzo's Ferrari clipped the barriers at the chicane and flipped. The car caught fire instantly and Lorenzo was terribly burned while an inadequately equipped crew of marshals extricated him. He died of his injuries within a week.